On Simon's Final Night, DeWyze is Named "American Idol"
Lee DeWyze, a paint store clerk who overcame his shyness to impress "American Idol" judges and viewers with his spirit and soulful voice, triumphed Wednesday over bluesy musician Crystal Bowersox in the contest's ninth season. When asked by Ryan Seacrest how he felt, an emotional DeWyze said, "I don't know. It's amazing, thank you, guys, so much ... I love you. Crystal, I love you." The finalists had closely matched fan bases, with just a 2 percent voting gap between them coming into the finale, Seacrest said. DeWyze's victory was based on votes cast after Tuesday's performance show, which drew more judges' compliments for Bowersox, 24, of Toledo, Ohio, than for DeWyze, also 24, of Mount Prospect, Ill. The finale made the most of Simon Cowell's last appearance as a judge. A film package recounting highlights from the Cowell years was shown and comedian Dane Cook came on stage to sing "Simon Says," made up of the Brit's barbed comments, and to crack a few jokes. "You have the honesty of Abe Lincoln and the charm of the guy who shot him," Cook told Cowell, who took the ribbing with a smile. The walk down memory lane continued with ex-judge Paula Abdul, who often played Cowell's sparring partner during the seasons the shared. "I've loved all the fun we've had together," Abdul told Cowell. "`American Idol's' not gonna be the same without you. But as only I can you, it will go on." Cowell, in turn, shed his usual cool in an on-stage appearance. The finale, as usual, was stuffed with humor, including the return of Larry "Pants on the Ground" Platt and William Hung, return appearances by former contestants and music stars. Bret Michaels, the ailing former Poison frontman and reality TV star, joined "Idol" finalist Casey James on one of the band's biggest hits, "Every Rose Has Its Thorn." The bluesy voiced Bowersox, whose status as a single mom and nurturing of the other contestants had earned her the nickname "Mama Sox," had basked in praise Tuesday. "You took that song and you absolutely nailed it," Cowell said of Bowersox's rendition of "Black Velvet," a song he said he's normally "allergic" to because it gets murdered. The assessments of DeWyze were respectful but more measured — with Ellen DeGeneres the exception. "Lee, I couldn't be prouder if I birthed you myself," she told him after he sang Simon and Garfunkel's "The Boxer." 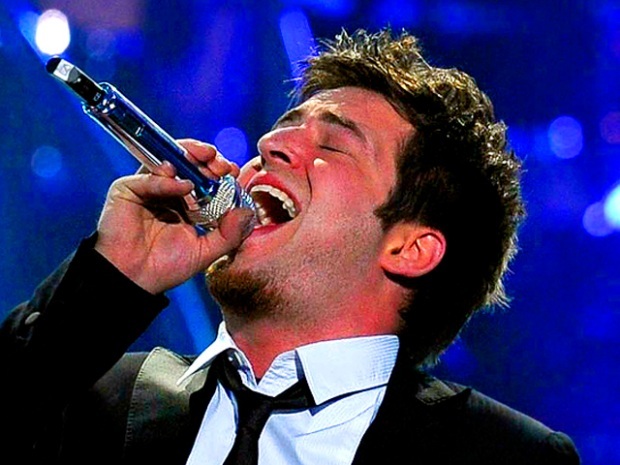 DioGuardi admired DeWyze as an "emotionally accessible" singer after he performed R.E.M. 's "Everybody Hurts" as his second number, but Cowell urged him to try harder. "When you come out for your last performance, I want a 10 out of, because you're capable of that," Cowell told him. With U2's "Beautiful Day," Jackson welcomed hearing "the guy with the strong big rock voice" and DioGuardi said he had "one of the most commercial voices of the season" and deserved to be in the finale. Cowell, who had pointed to DeWyze as the frontrunner before the finale performances, said that "American Idol" was designed for someone like DeWyze, who worked in a paint shop when he tried out for the show and needed a break. DeWyze's first single will be "Beautiful Day," which he performed Tuesday. Seacrest, who appeared to have an on-air testy relationship with Cowell this season, had only warm words for him Tuesday and Wednesday. "We really are going to miss you. You are a dear friend and we wouldn't be here without you," Seacrest said. Cowell isn't going far: He's going to produce and judge "The X Factor," a Fox version of his popular British talent contest.